As Passover approaches, we’re glad to share the many options for communal seders. Passover starts on Friday, April 19, and while there are many seder options on the 19th and 20th, there are also options throughout the holiday and beyond. If you have any questions about the holiday or where to celebrate, feel free to be in touch, and chag sameach! Please join us for the Philadelphia Jewish Labor Committee’s Annual Labor Seder. Within the context of a traditional Passover Seder, we will explore the role of women in the labor movement, and how robust unions are a key factor in addressing injustices such as gender and race based wage gaps and access to paid family leave. For questions, additional information, or to RSVP please contact Michael Hersch at mhersch@comcast.net or 215-668-5454. You’re invited to one of KleinLife: Center City’s biggest holiday events of the year – our Passover Seder. It will be held on Friday, April 12, from 11 am to 1 pm. Kindly RSVP by April 5, either at lellis@kleinlife.org, or by calling 215-832-0539. We will be honored to have you on our guest list! Be a part of the largest Passover Seder for grad students and young professionals in Philly. 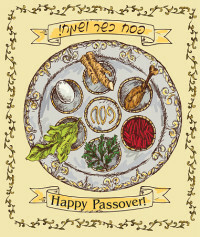 Join us for a delicious Kosher for Passover meal and retelling of the Passover story. All are welcome! Big thank you to our amazing sponsor, Post Brothers! See you there! Register here. All are invited to the Passover seders at Mikveh Israel. Please email info@mikvehisrael.org by April 12 to make your reservations. Member and non-member prices available. Join together for a multi-generational seder. Members and prospective members of all ages are invited to share the joy of Passover. Please BYOB. Click here to RSVP. Questions? Contact Marcia Biggs (215-627-6747). Led by Rabbi Julie Greenberg and Cantor Sharon Sigal. Reservations & payment must be received no later than Tuesday, April 9. Cancellations received by April 12 will be fully refunded. Complete kosher-style dinner and Passover wine are included. You are invited to bring dinner wine. If you require a Glatt Kosher meal, please contact us for information no later than April 5. Questions? Call 215-629-1995 or email info@leyvhair.org. Visit us at www.leyvhair.org. Join Rabbi Nathan Kamesar and he leads a creative, fun-filled, and interactive community seder in the social hall for synagogue members and guests. RSVPs and payments are required by April 5. Email office@societyhillsynagogue.org. Join the LGBTQ Initiative of JFCS in Philly & the Kol Tzedek LGBTQ Havurah for an LGBTQ Passover seder! We’ll join together as queer members of the Philadelphia Jewish community to enjoy a seder, the traditional Passover meal and service, while exploring themes like queerness, trans identities, activism, liberation, and freedom. Participants will have a chance to reflect on the history of Jewish and queer struggles for acceptance, as well as meditate on a future where our intersecting identities are celebrated. Register here. You will delight in a four-course vegan meal and learn about Passover’s connection with veganism. Jewish Veg helps people embrace plant-based diets in accordance with Judaism’s highest ideals of compassion for animals, concern for health, and care for the environment. Register here.